Maple butter, also called maple cream, is pure maple syrup that has been heated to approximately 18 degrees Fahrenheit above the boiling point of water. It is then cooled to around 125 degrees and stirred until it reaches a smooth, creamy consistency. 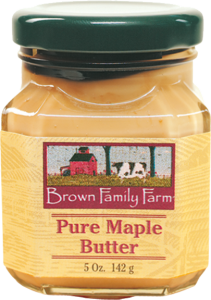 Try some maple butter today! Maple cream makes an ideal glaze for meats and fish. Spread it on toast, or mix it half and half with peanut butter. Use it as frosting for cakes and pastries. Although it is alternately called maple cream, maple butter contains no dairy. It has only one ingredient: pure maple syrup—usually a lighter grade such as Grade A Golden Color Delicate Flavor. Because it only has one ingredient, pure maple butter is not only dairy-free, it is also gluten-free, non-GMO, and paleo! If you don’t feel like making your own, you can buy maple butter right from our site. Storage tips: Store in refrigerator, even before it’s opened. Travels well out of refrigeration for about a week. Separation of some syrup in the maple butter is natural. Just stir before each use. Maple cream can be frozen to keep longer. It will not separate while frozen. Never microwave maple butter as it will melt back into syrup. Receive specials on pure Vermont maple syrup, maple candy, and maple products.